It’s no secret that I’m a big fan of roasting pecans around here, and the holidays are a good as any to put incorporate some cocoa into your nuts. Spiced almonds have a good amount of heat without being overwhelming and bourbon brings out the smokiness in a roasted pecan. Delicious. Both of these recipes are easily doubled and tripled depending on how many guests might be traveling through your home and how many games you plan on watching. A quick word on buying nuts; December is one of the best times of the year to find bargains on almonds and pecans. Even my local Whole Foods has three pound bags of pecan halves available for about $12 right now. That’s much cheaper (and fresher) than buying 6 ounce cans of pecans for about $8-9 dollars on the snack aisle. Put your nuts in large glass bowls and then spend the next ten minutes snickering over the “nuts” and “bowl” jokes running through your head. In the bowl with the almonds, combine all the ingredients except for the second 1/3 cup of hot water and stir until coated. In the bowl with the pecans, combine everything except for the granulated sugar, salt and extra water for roasting. Let both bowls of nuts sit and soak in their own juices for about fifteen minutes. Speaking of nuts soaking in their own juices, Spencer and Holly plan on recording a podcast for every single bowl game this year over on EDSBS, a feat that probably only those two can pull off. I am sure I am not alone waiting to see what sort of madness settles in by the time we get to the GoDaddy Bowl in two weeks. Once done soaking feel free to eat a raw nut or two check for seasoning and adjust as necessary. Spread the nuts on parchment paper lined (to roast nuts without parchment paper is as mad as covering all of the bowl games) baking sheets along with all liquid still left in the bowl. Sprinkle some of the granulated sugar and salt on to the pecans, reserving the rest for tossing in throughout the rest of baking process. Bake for 10-15 minutes, remove pans from oven and stir. Toss a little more sugar and salt on the pecans, along with some additional hot water if they are already starting to dry out. If the almonds are also drying out, toss with an additional 1-2 tablespoons of hot water. 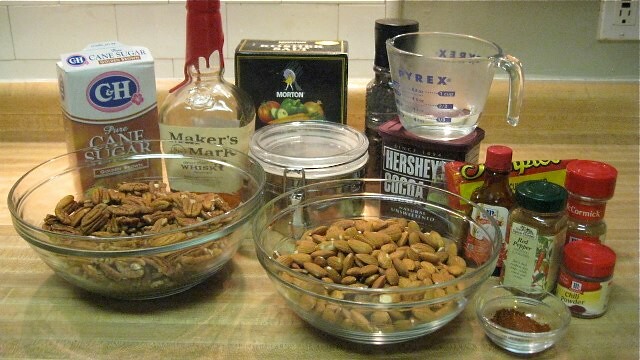 Continue baking the nuts and stirring them every 10-15 minutes, adding a touch more salt and sugar to the pecans and water as needed to both sheets of nuts along the way until done, forgoing adding any additional water in the last tossing so the nuts dry out completely. Should take about 45-60 minutes to get a really nicely roasted nut with this method. 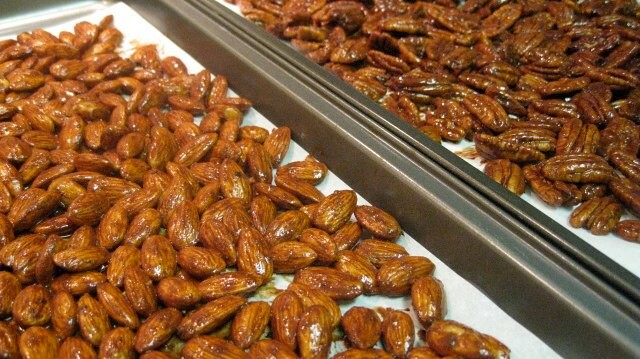 If you are baking both the pecans and almonds at the same time in the same oven, be sure to rotate the pans between upper and lower middle racks so as not to give too much heat to the bottom sheet and not enough direct warmth to the top, unless you have a convection oven that you have absolute faith in cooking evenly without any additional involvement from the chef. Once done, cool on clean parchment paper. 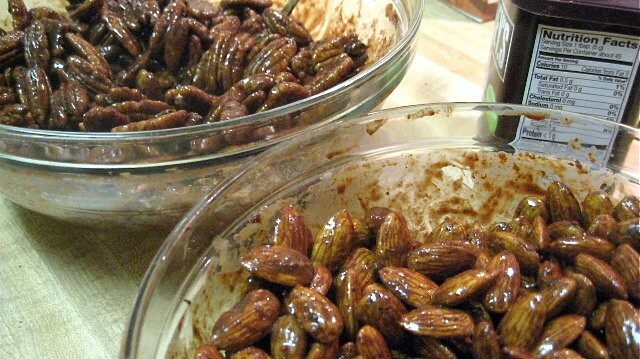 The pecans will taste smokey, salty and sweet, with the cocoa powder giving the usual candied nut a nice hint of earthiness, while the almonds will come alive with the mix of chili, cinnamon, cocoa and heat from the cayenne pepper. I actually think both nuts, especially the almonds, taste even better the day after roasting as the spices and cocoa have a chance to completely mingle together overnight. Both can be stored in air-tight containers for up to a couple of weeks (the advantage of using these water roasting recipes over roasted nut recipes that call for eggs) without losing any freshness. Easy enough to whip up a quick batch this weekend while you half-watch the New Mexico Bowl and be set through at least the New Year slate of games. ~ by Sarah Sprague on December 17, 2010.